1000 years ago, Sleeping Beauty was kissed by a prince, which removed a terrible curse from the kingdom. The rampant briars were held at bay, but the poor princess was left in her slumber. 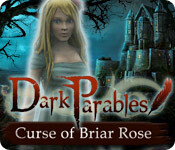 Follow a modern day detective as he travels to Edinburgh, Scotland, and attempts to end the curse once and for all in Dark Parables: Curse of Briar Rose. Dive into this eerie Hidden Object Adventure game and save Sleeping Beauty today! For a more in depth experience, check out the Collector's Edition. After their hiking trip takes a tragic turn, a group of friends are forced to travel between realms to undo an old wrong and save the Cypress Witch.